Instead of searching around you, Along the Way searches along your route making it easy to find cool spots along the way to your destination. Download Along the Way from the App Store! Along the Way is new way to search for anything while traveling the road! Along the Way searches your route so instead of just showing places around you, the app shows results along your route! Does Along the Way work in my area? Yes! Along the Way works anywhere in the world. Use it for road trips no matter where you live. How is it different from other search tools? 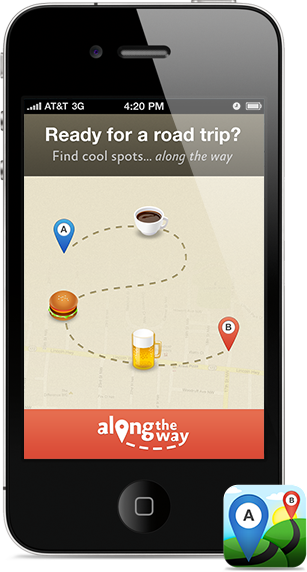 Along the Way searches your route making it easy to find places while traveling without backtracking!